Airdrie Public Observatory is one of only four public observatories operating in the United Kingdom. The Observatory is owned by North Lanarkshire Council and is operated on their behalf by the Airdrie Astronomical Association (AAA). It is located within Airdrie Library in Wellwynd. The Observatory is of significant historical and scientific interest, and has been an integral part of Airdrie since it was first established in 1896. It has recently been fully refurbished, a process which included the installation of a brand new dome and a complete overhaul of its historic telescope. The Observatory is now once again a fully-functioning and unique facility, and is a great place to visit for all types of groups, societies and clubs. Our dedicated Curators can provide advice, hints and tips on all manner of space-related questions. 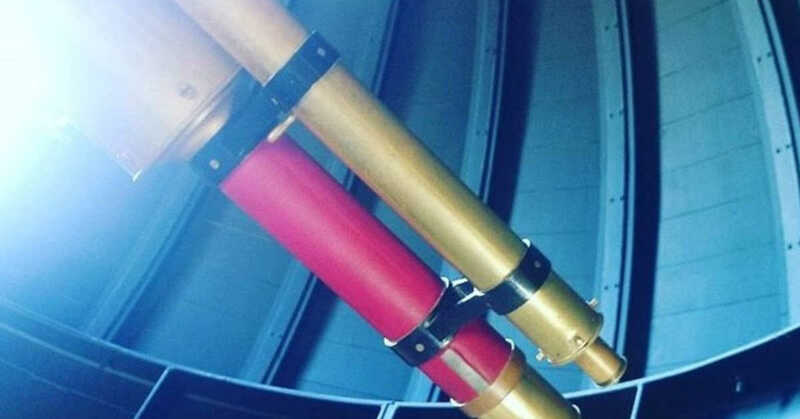 Whether you are a complete beginner or have an existing interest in astronomy, a visit to the Observatory can be a fascinating and rewarding experience. You are most welcome to pop in for some heavenly views! For further information, use the details in the ‘Contact Us’ box on the right hand side of this page. How you can help maintain our historic Observatory. Get a glimpse of what’s on and has been happening in the Observatory over the last year. It’s not just our Observatory that’s historic – our telescope is too. Find out more about both.